Keep in mind, there are only three of us. The kitchen in our house opens Thanksgiving morning, the cooking goes on for hours, then it’s closed until next Tuesday. There’s enough to warm up at least until then for any and every meal. Any thing that survives past Monday morning generally gets tossed. Some of the dishes reflect the melding of two families over the years. For example, the cranberry concoction is my wife’s favorite because it reminds her of Thanksgiving as a kid. I’m the same way with the cranberry gel in a can. I know it’s not gourmet fare. But any food that can spark a warm memory is the ultimate in comfort food. So we serve both. The same is true with the dressing. We’ve experimented with just about every recipe there is, and one mixture with sausage is my wife’s preferred dish. Having grown up in Norfolk near a lot of seafood, I love shell fish, so mixing some stuffing up with oysters and chopped up remnants of the bird’s liver and gizzards is a favorite of mine. We do both, and I can tell you, these are the first two side dishes to disappear from the refrigerator. Good stuffing covered in good gravy can sometimes rival good ice cream covered in good chocolate sauce. Then, of course, there is dessert. In both of the homes my wife and I grew up in, making pies – and a lot of them – was what you did the night before Thanksgiving. I haven’t done a true scientific study of this, but someone must have determined you need to cook 1.3 pies for every occupant of the house, as that’s just about the ratio we both were raised with. We like variety so we usually have several pumpkin pies as well as apple and cherry pies. Lately, peach cobbler has started to gain most-favored-nation status for us and I wouldn’t be surprised to see it gain a seat at the Thanksgiving table in future years. Ice cream is a must for the fruit pies. 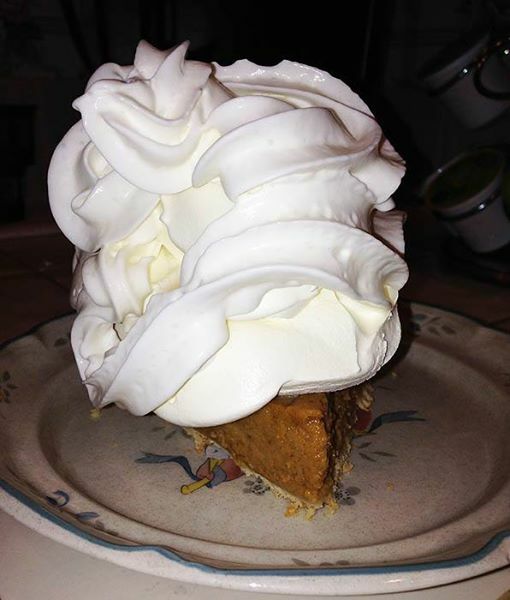 As the picture above shows, cool whip in large quantities is mandatory for the pumpkin pies. In the end, however, it’s not really all about the food. It’s also about the memories of enjoying a particular side dish with friends and family in years' past, realizing some are no longer with us. Or about the smell in the kitchen as a child while watching some huge inflatable turkey in the Macy’s Day Parade. Or about chuckling as your new bride and her mother battle during those first few years together over who was going cook what in the kitchen. Note to you young bucks: There can only be one queen in the kitchen. If wife and her mother are arguing about who decides what, go in the basement and pretend to be working on something. The mother-daughter relationship is complicated. You can get burned on Thanksgiving by more than just a hot turkey pan. No matter what is served, I also believe that in life, you only get so many Thanksgivings or Christmas Days and need to value every one left in your life. So they could serve Captain Crunch at this restaurant and I will still feel blessed getting to enjoy one more Thanksgiving with the women of my life: my wife, my daughter and my mother in law. If they’re happy, I’m happy. But I’ll be even happier if somehow this restaurant is serving cranberry gel from a can ???? I am fortunate in that even though no member of my side of the family remains within 100 miles, Becky's family is large and they cook like maniacs too. My son is down from NOVA and we will be the ones who are stuffed before we head to SWVA to hopefully keep that other streak alive.